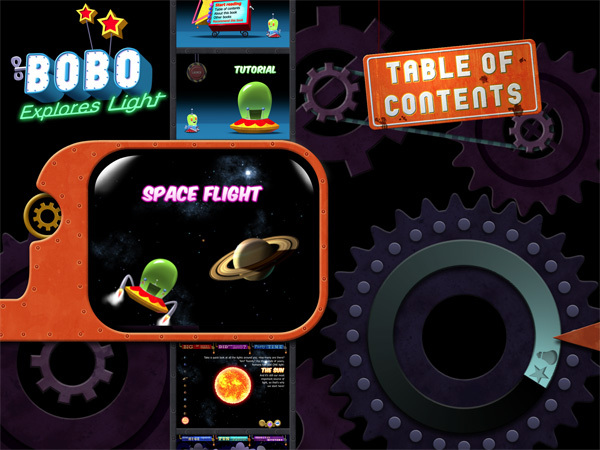 A true geek app, Bobo Explores Light has so much things to learn for both parents and juniors. It's a great and handy reference for various topics related to the science of light. Bobo teaches your junior all sorts of interesting things about light. Bobo is a robot from outer space that travels through our solar system to explore the science behind light and other related topics. Throughout the app, Bobo will assist you by becoming a model or a test subject for your research, projecting 3D holographic images that you can manipulate by tilting your iPad and singing "We are the Champions" when you are not in the mood for tapping the screen. Bobo has a playful and cheerful personality. He loves to celebrate whenever a task is completed. "Ta-da", "Yay", and "Wow" are some of the things he can say in addition to his own name. In Bobo Explores Light, you can learn about many light-related topics, including lightning, fire, Thomas Edison, telescope, colors, the human eyes, bioluminescence, photosynthesis and aurora. Quite a handful, if you ask me. Only a few apps can offer this level of depth. In addition to scientific topics commonly found in textbooks, the app also touches on pop culture. If you ever wondered how a lightsaber from Star Wars works or if you wanted to role play as Zeus, the God of Lightning - well, you can find those in this app. There's also other cool things like tilting your iPad to steer a spaceship across the solar system and 3D holographic images. Take a tour around the solar system with Bobo. Bobo Explores Light is an excellent app that has helped me introduce the concept of planets to Philip, my 3-year-old son. It amazes me how easy the app illustrates the solar system by visiting one planet after another. It will also become my point of reference the next time we stargaze at night. Another "a-ha" moment for me was when the app introduced the concept of shadows. I really had fun with Philip as it was his first time learning about the concept. Without the app, I wouldn't known how I was going to explain that to him. I also like how the app lets you manipulate items on screen and dynamically generate results based on your touches. For example, you can create multiple fireworks by touching the screen. It's also really easy to capture these moments via a screenshot button within the app. Finally, if you're not sold already, Philip really loves how he can role play as Zeus and play around with the disco lights from the 80's. I never thought he would love something that retro. Junior and Bobo doing the disco! Bobo Explores Light is a must-have app if you have juniors from 3 to 10 years old. The app has so much content that I have yet read all of the articles offered after exploring it for more than a couple of hours. The interactivity, sound effects, videos and Bobo himself add to an amazing learning experience.